Note: Since the size above is measured by hand, the size of the actual item you received could be slightly different from the size above. Meanwhile, please be reminded that due to lighting effects, monitor’s brightness / contrast settings etc, there could be some slight differences in the color tone of the pictures and the actual item. 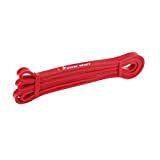 Resistance Loop Bands – Set of 4 exercise bands for building muscle, improving strength and mobility. Ideal for helping to rehabilitate a sports injury, physical rehabilitation, physio, Boxing, Cross Fit, HIIT, Yoga or Pilates. Gym In A Bag exercise kit that includes 4 premium resistance bands, carry bag and resistance band guide ebook. The Bison Bands by Ambision Fitness are Suitable for Men or Women of all fitness levels from the beginner to the advanced user. Gym Weight Lifting Gloves by Nevaey | Workout Gloves, Crossfit Gloves, Exercise Gloves, Training Gloves Keeping a Natural Feeling Without the Blisters! For Both Men & Women!